Ah, zucchini. You poor vegetable. Your very name conjures up visions of desperate gardeners who have underestimated the rate at which you grow. Who hasn’t received an unwanted gift of summer squash the size of small baseball bats? Much of the time, the gift-givers should not have bothered. When left to grow to these proportions, zucchini becomes a seed-filled, bland, and cottony sponge. At that point, it belongs in your kitchen only if you intend to hide it in a quick bread. Gardeners and farmers, please cut zucchini from the vine when it is still in its prime. It should feel smooth and very firm, and should taste sweet when sampled in its raw form. Cooks, know that zucchini does not have to be the burden of the season. Play artist, and let this malleable vegetable be your canvas. Zucchini is like chicken that way, with a modest profile that allows you to dress it up however you please. Here are some suggestions for an abundant crop that, chosen and prepared carefully, is sweet and flavorful. And once summer squash is cooked through, it is easily blended into an exceptionally smooth purée. I’ve chosen a few unusual preparations to highlight these qualities. Zucchini can easily be turned into a light, creamy purée that adapts to multiple uses. Just choose relatively small squashes without many seeds, cook them all the way through, and let your food processor do the rest. I was at work one recent afternoon when we decided our appetizer plate needed another element. My employer, Cathy Whims, is normally a stickler for the traditional cuisine of Italy, but that day she surprised me and suggested I make a zucchini baba ganoush. I rubbed whole squashes with olive oil, salt, and pepper, and then roasted them until they were brown and soft to the point of collapsing. Once they cooled, I sliced them in half lengthwise and scooped out the seeds, just as you would with eggplant for traditional baba ganoush. I then puréed the flesh in a food processor with tahini, garlic paste, lemon juice, and olive oil. The zucchini tasted more delicate and less smoky than eggplant roasted over flame would, so I used less seasoning. The result was slightly mysterious tasting, and delicious as a dip for such flatbreads as pita or focaccia. Herbs — parsley, mint, or basil — would also enhance the light green purée. (If you use herbs, omit the tahini.) Sprinkle the herbed purée with feta cheese and cherry tomatoes cut in half and dressed with oil and vinegar. This made me think of adapting a Faith Willinger recipe (from her book Adventures of an Italian Food Lover) for eggplant purée with ricotta cream and tomato tartare, substituting zucchini for the eggplant. The title sounds complicated, but you only need to microwave the eggplant (or zucchini) before throwing it in the blender. You do have to peel and seed the tomatoes (see my instructions for peeling tomatoes), but that's the most technique the recipe requires. The ricotta is simply mixed in the blender with olive oil, seasoning, and a little of the tomato water. It’s an elegant dish that I recommend for parties, whether you make it with eggplant or zucchini or both, as two separate purées on an elaborate antipasto platter. Like all the squashes, zucchini has a high sugar content that you should use to your advantage. The key is to choose a direct heat method such as roasting, sautéing, or grilling. You want to expose the zucchini to a hot cooking surface to make it brown evenly over as much surface area as possible. To do this, slice the zucchini in thin strips on a mandoline or slice squashes by hand at an angle to form wide pieces. One of my favorite late-summer soups is based on this principle. It’s a silky-smooth zucchini purée that I like to make with a Middle-Eastern-type summer squash if I can find it. 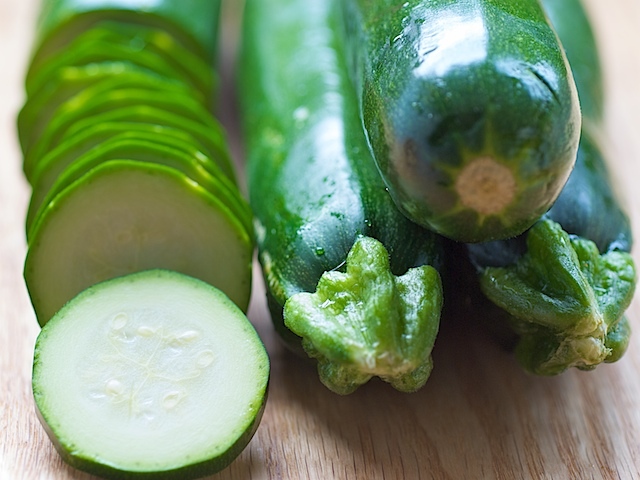 These pale green zucchini possess a fine grain and a nutty flavor. They are caramelized for the soup, which has an elegance that leaves zucchini’s reputation for blandness in the compost heap. Brown 1/2-inch-thick slices of zucchini in a wide skillet with olive oil over medium-high heat. You want a deep nut-brown color. Sauté the slices in batches in order to avoid crowding them; crowding will cause the zucchini to steam and get soggy rather than caramelize. Then put the zucchini in a soup pot with sliced yellow onion that you have slowly browned in the same way as the zucchini. Add water or chicken stock just to cover and salt. Bring it to a simmer, then cook for about 5 minutes, or until the vegetables are thoroughly soft. After a purée in the blender, serve the teak-colored soup with a drizzle of olive oil and strips of squash blossom, if you have them. You could also float grilled or sautéed shrimp on top of the soup with diced fresh chiles, torn basil, and olive oil. Don’t feel obliged to use the oversize squashes that inevitably will turn up in your garden or on your doorstep. But don’t pass up zucchini wholesale at the farmers’ market, either. You don’t want to miss a vegetable that lends itself to surprisingly elegant preparations.